Fife drinks company Spencerfield Spirit is celebrating after being crowned a double winner at the national Scotland Food & Drink Excellence Awards. Spencerfield scooped the coveted Drinks (alcoholic) category with its whisky, The Feathery and also the overall Small Business of the Year award. 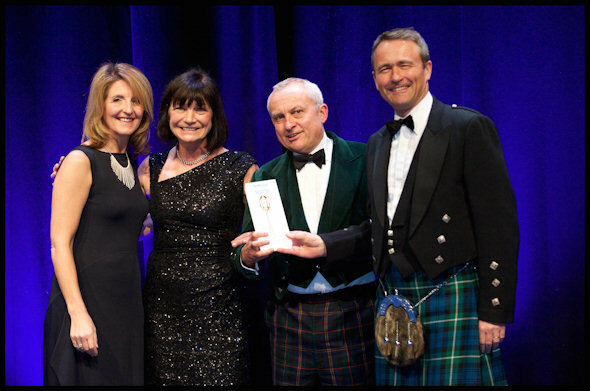 The winners were announced last night (Thursday 22 May) at a glittering awards ceremony, hosted by Scottish television presenter Kaye Adams, at the Edinburgh International Conference Centre. With 22 award categories celebrating excellence across Scottish food and drink, the Scotland Food & Drink Excellence Awards showcased a broad spectrum of food and drink companies from across the country. Commenting on the awards, Alex Nicol, Managing Director of the Spencerfield Spirit Company said: “We are delighted to be recognised at the prestigious Scotland Food & Drink Excellence Awards and it’s particularly exciting that The Feathery has secured its first award since launching earlier this year. The award judges tasted 115 food and drink entries and examined submissions for 154 entries from 102 businesses across all the categories. The Feathery is a blended malt which has been entirely matured in first class sherry wood which makes it slightly sweeter, fuller and more rounded than standard malts. It is the first expression of a range being developed by Spencerfield to celebrate the original Scottish craftsmanship. For more information, please visit http://www.spencerfieldspirit.com.